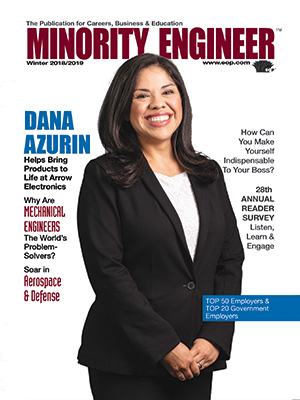 Minority Engineer Magazine, launched in 1979, is a career- guidance and recruitment magazine offered at no charge to qualified engineering or computer-science students and professionals who are African-American, Hispanic, Native American, and Asian American. Minority Engineer presents career strategies for readers to assimilate into a diversified job marketplace. This magazine reaches minority engineers nationwide at their home addresses, colleges and universities, and chapters of student and professional organizations. If you are an engineering student or professional who is a member of a minority group, Minority Engineer is available to you FREE! Chemical engineers drive innovation via creativity and diversity as they formulate the future via their vital work. Despite the fact that chemical engineering transcends many industries and offers many job options, the evidence is clear - more members of minority groups and diverse cultures are needed in this sector. Acknowledging that diversity is both beneficial and necessary in the workplace, data recently collected among chemical engineering members of the American Chemical Society (ACH), indicated a wide disparity between the race and ethnicity of the organization’s domestic members. According to a 2014 finding, 80% of ACH domestic chemical engineer members were white, while only 2% were African American, 9% Asian and 4% Hispanic - proof-positive of the need for more diversity, which has been proven to drive innovation, and increase productivity and communication among team members. Furthermore, from a business and ethical perspective, there’s no doubt that employing a more diverse workforce will help to ensure the global imperative of diversity and inclusion. Richard Lorenzo-Arocho, Jean Tom, Rodney Porter and Obafemi Oladapo, chemical engineers representative of Eastman Chemical Company, Bristol-Myers Squibb, Shell Oil and PPG, respectively, collectively agree. Throughout her 12-plus years with 23,700-employee, New York, NY-headquartered global biopharmaceutical company Bristol-Myers Squibb, Jean Tom’s expertise has been an exemplary force for her company and her coworkers. A graduate of MIT with a Bachelor of Science in chemical engineering and chemistry, and a graduate of Princeton University with a Ph.D. in chemical engineering, Tom credits her previous work in chemical engineering with building her proficiency and knowledge. “On the technical side I garnered much of my collective skills working on multiple processes in the laboratory, plants and factories,” she reports. Currently Tom’s work involves the company’s pipeline portfolio development of small molecule compounds. Her oversight ensures projects are appropriately staffed, and her team is pursuing and using technology and innovation that speed up process development, and develop effective and innovative future leaders. The skills she finds most necessary include a foundation in the fundamentals, a passion for solving problems, an ability to communicate and collaborate effectively, and a willingness to seek opportunities. With chemistry hailed as the basis of life, Tom contends that chemical engineering plays a critical role in translating that chemistry into products and processes for essential uses such as energy, food, medicine, water and materials. As such, she views chemical engineering as a career that will always be needed. “Engineering is a very analytical approach to science, and being a chemical engineer in any of these fields does not mean just working in a lab or plant,” says Tom. Tom finds great enjoyment in working with people. “Mentoring other engineers and watching them develop into technical and project leaders and managers is one highlight of my job,” she notes. She also champions efforts to further diversify the workforce of chemical engineers at Bristol-Myers Squibb, referring to a newly implemented outreach program designed to bring more young women to the company to learn about the work of chemical engineers. “I feel strongly about giving back to the chemical engineering profession and letting the broader chemical engineering community know about the work being done in the pharmaceutical industry,” underscores Tom, a member of the American Institute of Chemical Engineers (AIChE) and a volunteer program evaluator for ABET, the organization that accredits chemical engineering programs in the U.S. and abroad. For further Bristol-Myers Squibb information visit www.bms.com, bms.com/job-seekers.html , LinkedIn, Twitter, Facebook and YouTube. Richard J. Lorenzo-Arocho is outstanding in his role as subject matter expert responsible for ensuring safe, effective, efficient heat transfer processes at Kingsport, TN-headquartered Eastman Chemical Company. The rise to success for the senior chemical engineer began 12 years ago when he joined the 14,500-employee global advanced materials and specialty-additives company. “During 2006 I worked at Eastman as a co-op student, and started full-time after graduating a year later,” explains Lorenzo-Arocho, a native of Puerto Rico who holds a Bachelor of Science in chemical engineering from the University of Puerto Rico. Currently one of Eastman’s heat transfer specialists, Lorenzo-Arocho troubleshoots, designs and devises heat transfer solutions essential to keeping the company’s worldwide plant equipment and processes running efficiently. A member of the technical committee for the Heat Transfer Research, Inc. (HTRI) since 2017, he notes that, as a leading source of process heat transfer research, software and services, HTRI has been used for decades by worldwide companies to help them design, operate and maintain heat exchangers and fired heaters. Recalling his early interest in math and science, Lorenzo-Arocho found engineering to be an obvious career choice. “Chemical engineering made sense given my long-held interest in how things form at a molecular level,” he points out. Grateful for the education he received, he’s now an active recruiter for his alma mater. “Chemical engineering is a great field. The discipline is important, and will continue to be essential and attractive to those who recognize that it’s a field in which participants can contribute to different roles in various industries including design, manufacturing, construction, specialty products, innovation, healthcare, pharma, technology, environmental, safety and others,” he asserts. Eastman regularly recruits and hires chemical engineers, as well as engineers in other disciplines including mechanical, electrical and civil, according to Lorenzo-Arocho. “Engineers have a wide range of career opportunities at Eastman. From being hands-on in the plant to researching the next innovation, there’s a career path to fit individual interests and passions. The skills you acquire as an engineer can open the door to many career paths,” he states, adding that recognizing different options is important information to relate to young minorities with an affinity for technology. He also emphasizes the value of students partnering with their schools and student organizations to encourage more companies to engage in campus visits to discuss the types of engineers they seek. As a subject-matter expert, Lorenzo-Arocho enjoys mentoring Eastman’s newer team members, as well as recruiting potential candidates for positions. “Helping others and solving problems is what I love to do,” he says. He’s also a strong supporter of his wife, an Eastman team member and mom to their four children, in her efforts to establish a new employee resource group (ERG) that will tap into Eastman’s Latino community. “The intent of this organization is to provide sustained long-term value creation to Eastman, cultivate professional development through leadership, learning, development, mentoring and networking, as well as increase overall awareness and education about the ERG,” he explains. For further Eastman information visit eastman.com, jobs.eastman.com, Twitter, Facebook, YouTube and LinkedIn. At Shell Oil Company, Rodney Porter is well-steeped in the oil industry experience. “Having worked for major oil and gas companies for several years, when Shell came calling 13 years ago, I jumped at the chance to work close to my hometown of Baton Rouge, [LA],” he explains. As custody transfer measurement (CTM) and hydrocarbon mass balance (HMB) improvement manager and global process owner (GPO), Porter and his team work to ensure accurate crude/feedstock receipts and fuel/chemical product deliveries to and from manufacturing site custody transfer boundaries. “Today, in my multidiscipline/multifunctional position, I continue to draw upon on my previous training and assignments that prepared me for the position I now hold,” comments Porter, who holds a Bachelor of Science in chemistry from Southern University, as well as a Bachelor of Science in chemical engineering and Master of Science in engineering science from Louisiana State University. He further contends there will continue to be new challenges for chemical engineers such as energy transitions to biofuels/chemicals and hydrocarbons from electrolysis, to name a few. As for introducing more members of minority groups and diverse cultures to chemical engineering, Porter praises summer STEM programs and camps that attract underrepresented groups to STEM disciplines. “These programs have made a tremendous difference in increasing the number of minority students attracted to these fields,” he asserts. And while Porter maintains that it goes without saying that strong technical and analytical skills are essential, soft skills, including critical and innovative capabilities, self-reliance and awareness, are additionally imperative for success in chemical engineering. Porter enjoys - and values - the chance to work with diverse individuals at Shell, which has global headquarters in The Netherlands and U.S. headquarters in Houston, TX. “Doing so has taken me out of my comfort zone and enabled me to grow in multiple ways. Working for a global company of 90,000 employees has also provided me with many opportunities in this space,” he states. Porter serves as Shell liaison for the National Action Council for Minorities in Engineering (NACME), Shell recruitment ambassador at Southern University in Baton Rouge (an HBCU) and sponsor for Louisiana State University in Baton Rouge Recruiting into Engineering High-Ability Multicultural Students (REHAMS). For more Shell information visit shell.com, shell.com/careers.html, shell.us/careers.html, Instagram, YouTube, Facebook, Flickr, Pinterest, Tumblr, Twitter, LinkedIn, Google+, Sina Weibo and V-Kontakte. Obafemi Oladapo focuses on projects and processes that affect daily life at Pittsburgh, PA-headquartered PPG, a global supplier of paints, coatings and specialty materials that’s been in business for the past 135 years. As a process engineer with this Fortune 500 company for 14 months, Oladapo is responsible for the successful completion of engineering projects at PPG’s Little Rock, AR facility, which manufactures protective and marine coatings. His job duties also include coordinating technical and management aspects of projects, and updating all facility drawings created in AutoCAD - a computer-aided design and drafting software application - as changes to them are made. Oladapo is part of PPG’s diverse workforce of approximately 47,000 employees who work in more than 70 countries, serving customers in construction, consumer products, industrial, and transportation markets and aftermarkets. Before moving to the U.S., Oladapo earned his first of two college degrees, a Bachelor of Science in petroleum engineering from Covenant University in Nigeria. During this time he secured a project engineering intern position in which he was responsible for the supervision of work related to the blasting of vessels, and to the carrying out of field measurements, cost calculations, and improvement plans. Before graduating, he co-led a project focused on the research of alternative energy sources to reduce global warming and waste of wood via the extraction of biodiesel from sawdust. Oladapo then worked as a fabricator and welder before deciding to pursue a second Bachelor of Science degree in mechanical engineering from Kennesaw State University in Georgia. While completing his second degree, Oladapo interned at a company where he gained hands-on experience in overseeing, inspecting and monitoring field-work operations. “My internships taught me to be a fast learner and work with a diverse group of people to achieve productive results - attributes essential to success in engineering, along with a positive attitude and willingness to learn,” he maintains. Early in his career, Oladapo knew he wanted his work as an engineer to focus on projects and processes that impact daily life. “That is what attracted me to my current employer. PPG has a reputation for being an ethical company that offers its employees great experiences and opportunities to grow,” he states. A member of the National Society of Black Engineers (NSBE), whose mission is to “increase the number of culturally responsible Black engineers who excel academically, succeed professionally and positively impact the community,” it was important for Oladapo to work for an employer that shared his values and would reward his talents as an engineer. “PPG is heavily involved in NSBE and strongly believes that for manufacturing to be successful in the future, business leaders must be at the forefront of engaging African-American and other minority talent in engineering fields,” he notes. Confident that PPG is committed to hiring diverse talent in skilled manufacturing and STEM-related fields, Oladapo sees that as key to economic success and continuing global development. “At PPG the belief is that the success of the company, and the success of its customers, is tied to its people,” he remarks. Additional information about PPG is available at ppg.com, global.careers.ppg.com/Home.aspx, LinkedIn, YouTube, Facebook, Twitter and Google+.